Right now I'm at work, but I have a little break, so I decided to do a quick post on what I'm wearing right now! For tonight, I decided to go with a brown faux fur stole, which is one of my favorite accessories, I have it in so many colours! This one actually used to belong to my mom back when she was younger, how cool is that? It's vintage! But anyway, I think you can really glam your outfit up by just wearing one of these. I also wore my favorite thigh high boots, which I'm totally addicted to right now, and... I got rid of my black pants, if you haven't noticed! I'm just so keen of my black pants for some reason... but today I chose a brown one instead! Haha! Do you like it? Oh, and I've been meaning to show you something I've been working on lately! On Monday we are going to have a really important photo and video shoot to do, we are going to be doing 6-7 videos, and it's going to take all week to get them all done probably... but it will be worth it! I'm going to be styling both the shoot and the video, doing makeup, and directing the video also! Which is so exciting because it's probably one of my favorite things to do, it is just so fun! I can't wait! The themes are still a secret, I will reveal them to you in a few days, for now I wanted to just show you a little sneak peak of some of the items which will be used! 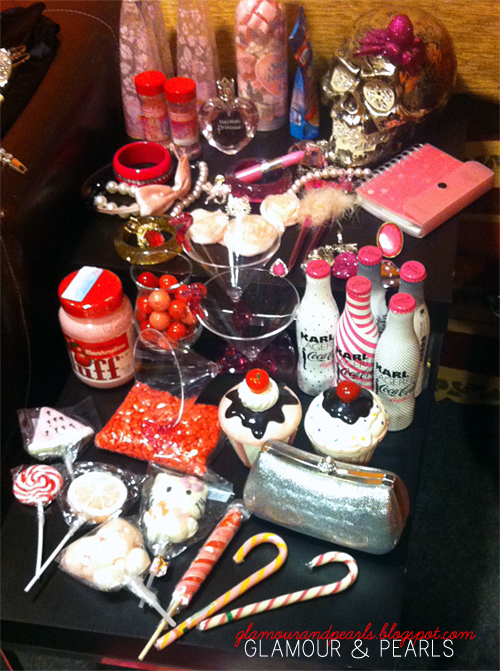 The section I snapped a photo of is the pink section, and it has all sorts of jewelry, cocktail glasses, bubblegum, marshmallows and just very girly things in it! Sorry for the blurry picture, but I was in a hurry and only had time to snap a quick shot! I'll post the rest of the pictures which were taken with a professional camera! We Make the World IPhone 8 slim case and Thin iPhone 8 case that maintains the your Phone in original look and protecting it from scratches, every day wear and tear.